The characters included in this Capcom fighting game are mostly from Fate/stay night, and some come from Fate/Zero and Fate/hollow ataraxia. 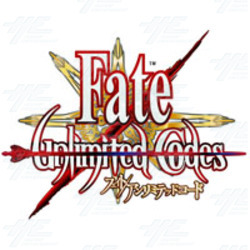 Fate Unlimited Codes is based on the events of Fate/stay night and the story is told from the playing character point of view. Intro movie for the arcade game Fate/Unlimited Codes - a 3D fighting game by CAPCOM based on the TYPE-MOON "Fate" universe.